Finding Moonshine: Messiaen, Maths and Me. 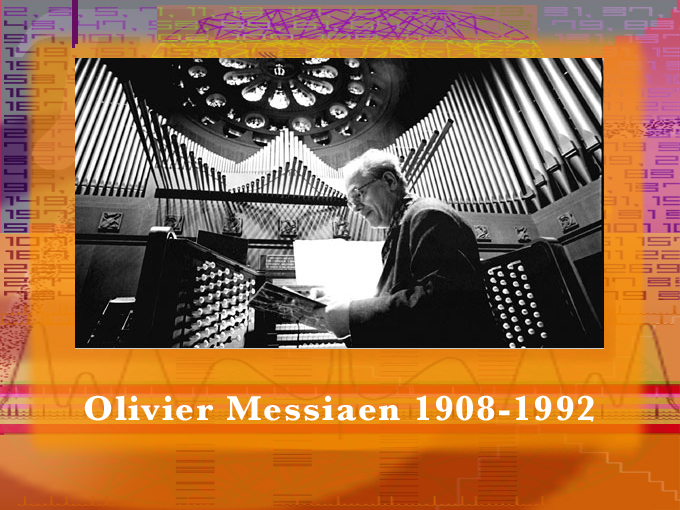 My relationship with Messiaen began one Saturday when I was seventeen years old. Saturdays for me as kid always meant music. A minibus would pick up me and my trumpet and after an hour of winding through the lanes of Oxfordshire we’d arrive in Oxford to join the rest of the ranks of the county youth orchestra. Except this particular Saturday was rather special. The conductor of the London Sinfonietta had come to visit and he’d brought with him the score of the Turangalila Symphony. I remember that day because I think I was at the peak of my trumpet playing. I didn’t split a note. I got my fingers round the incredibly complex melodic lines that Messiaen had cooked up. It was totally exhilarating. My trumpet playing has been down hill since but that Saturday was the start of my love affair with the music of Messiaen. My initial reaction was a totally emotional, visceral response to the extraordinary sound scape of Turangalila. But as my listening has continued I have begun to understand what a sophisticated mathematical mind Messiaen had. Talking to composers who studied under Messiaen it seems that he did not lay claim to any particularly superior mathematical knowledge. For me this makes it all the more interesting since he is clearly being drawn intuitively to mathematical structures of interest for their aesthetic appeal. This is perhaps the curious point for mathematical outsiders to appreciate. Mathematics does not consist of true statements about numbers just as music is not simply a sequence of notes. There is an aesthetic choice made by a mathematician of which true statements about numbers get elevated to the status of mathematics. Here is the French mathematician Henri Poincaré talking about this idea of choice: "To create consists precisely in not making useless combinations. Invention is discernment, choice. . . .The sterile combinations do not even present themselves to the mind of the inventor." His skill at using mathematical ideas to create interesting musical landscapes is perfectly illustrated in one of his most famous pieces: The Quartet for the End of Time. This piece was written while Messiaen was a prisoner of war in Stelag-VIII A. While he was there he met a clarinetist, cellist and violinist among his fellow inmates. He decided to compose a quartet for the three musicians with himself on piano. The result was one of the great works of twentieth century music. It was first performed to inmates and prisoner officers inside Stelag VIII-A with Messiaen playing a rickety upright piano they found in the camp. 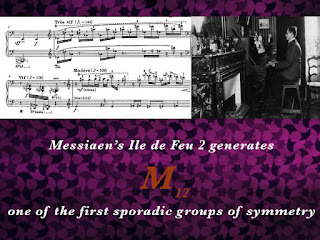 To create a sense of unease and impossibility Messiaen makes use of some of the most enigmatic numbers in mathematics. 2,3,5,7,11,13… The primes. The indivisible numbers. In the first movement, called Liturgie de Crystal, Messiaen wanted to create a sense of never-ending time. The primes 17 and 29 turned out to be the key. While the violin and clarinet exchange bird themes, the cello and piano are responsible for the rhythmic structure. If one looks at the piano part one finds a 17 note rhythmic sequence repeated over and over but the chord sequence that is played on top of this rhythm consists of 29 chords. So as the 17 note rhythm starts for the second time, the chords are just coming up to about two thirds of the way through its sequence. The effect of the choices of prime numbers 17 and 29 are that the rhythmic and chords sequences won’t repeat them selves until 17 x 29 notes through the piece. 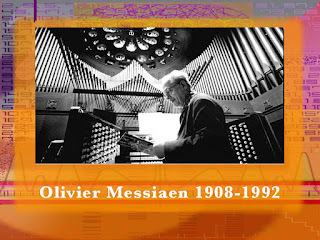 This continual shifting and changing music creates for Messiaen the sense of timelessness that he was keen to establish. The different primes 17 and 29 keep the two out of sync so that the piece finishes before you ever hear the music repeat itself. It’s not just in Messiaen’s rhythmic choices that he demonstrates mathematical sensibilities. Messiaen was highly influenced by Schoenberg’s twelve tone system where scales were thrown away and substituted with permutations of the twelve notes of the chromatic scale. One of the set of permutations Messiaen explores in his piece Ile de Feu 2 for piano gives rise to an incredibly sophisticated mathematical setting which was only discovered towards the end of the nineteenth century. If you think of the twelve notes of the chromatic scale like a pack of 12 cards then the permutations of the 12 notes which Messiaen uses in Ile de Feu 2 are got by performing a rather special shuffle of the cards called the Mongean shuffle. Effectively you take the pack of cards in one hand then reorder them by alternatively placing each card under or over the stack you build in the other hand. Viewed from my mathematical perspective these permutations are the generators used to create a special symmetrical object called the Mathieu group M12. This symmetrical object is one of the building blocks of symmetry and has 95040 different symmetries. We cannot see this symmetrical object because it lives in 11 dimensional space. The permutations are in effect telling you where the corners of this shape are moving under each symmetry. The discovery of this sophisticated symmetrical object was the first inkling for mathematicians of how complex the world of symmetry would turn out to be. But these shuffles of the 12 notes are also at the heart of Ile de Feu 2. 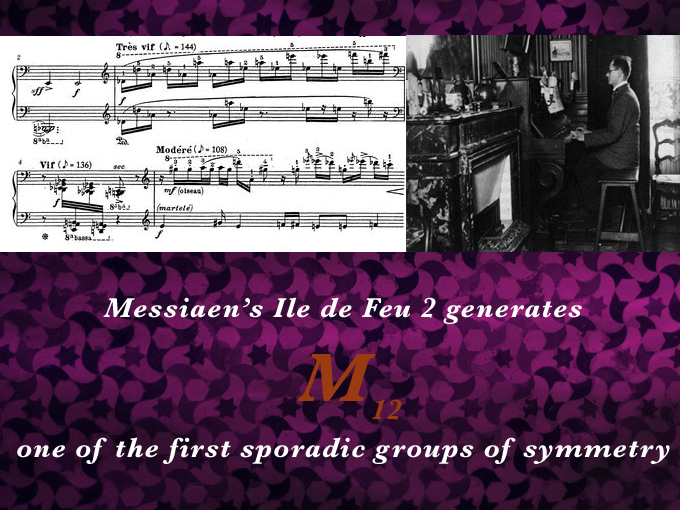 Quite independently Messiaen realised in sound one of the most intriguing mathematical objects discovered in the nineteenth century. So although we can’t see this object Messiaen has given us a way to listen to it. His motivation for his choice of musical ideas was often that they should have “the charm of impossibilities” about them. “This charm, at once voluptuous and contemplative, resides particularly in certain mathematical impossibilities of the modal and rhythmic domains.” But what is curious to me is that often it was his implementation of mathematics in music, intuitively or consciously, that made possible the breakthroughs Messiaen made in his music.